BOX is a 30min circus show suitable for indoor and outdoor events. The show will be a playful duet aimed at a family audience. BOX uses a 1.2 meter cube, custom built for two performers. The cube is their world and being upside down, performing acrobatics is part of who they are and how they conduct themselves. During creation we will be looking at the sibling relationship between the two performers and how far can they push and challenge each other in their games. Both performers are international handstand artists and acrobats, I want to see how much can be done upside down, how much interaction we can have, how close you can stand to each other whilst balancing on one arm, what happens if you chase each other or are connected when in a handstand, and what does it take to put the other person off balance. Everything used in the show, including the performers starts inside the cube. Throughout the piece more and more props, hand-balancing equipment and a set of steps leading to the top of the cube emerge. The playful relationship between the performers will show the competitiveness in their friendship, as they each struggle to get more attention from the audience than the other, and win the challenges they set up for each other. The project had one period of R&D on a very basic version of the set as part of Transmission at Jacksons Lane; the company also showed a small section at MK Gallery. This was funded by Grants for the Arts and through Kickstarter, with support in-kind from Jacksons Lane, MK Gallery and Greenwich Dance Agency. At the beginning of February the company completed three days of R&D on a more fully established set. 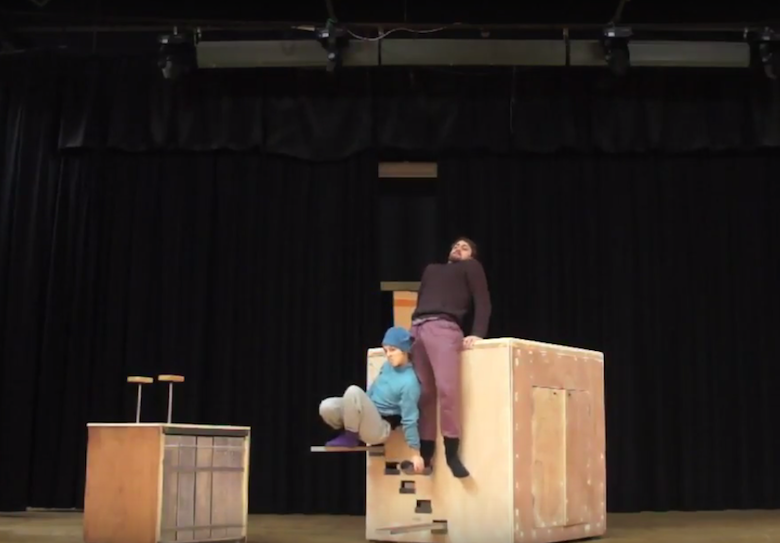 The set is a 1.2 metre cube, with handstand equipment built into it and a small Box held within the larger one. This can be removed. Ideally wooden flooring with dance floor on top. The show is self contained and music playback is inside the cube.